Massage Sandals Brown (Men’s size 9) | Medical Supplies and Equipment. Massage Sandals Brown 9 with velcro toe strap. 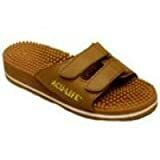 Acu-Life Massage Sandals are based on the principle of reflexology, which has been practiced for at least 5000 years. Reflexologists believe that each important organ and muscle is connected by a network of nerves to a tiny point on the foot where energy terminates. Pressure applied to these nerve endings by Acu-Life’s hundreds of little rubber “fingers” creates a stimulus. This sets in motion an electrochemical impulse, thus releasing healthful energy along the nerve to corresponding organs.